Sleep is something that I am fascinated by. I find it so intriguing that one of the best parts about waking up in the morning is checking my sleep tracking app, Sleep Cycle, to see the previous night's graph. I know I am not the only one who craves bed time and is especially thrilled for it after an especially long and tiring day. I mean who doesn't love a morning when no alarm is set and you seem to have endless hours to catch up on some shut eye? Sounds like a dream. Unfortunately, for most of us we instead must fall into the habit of going to bed at a decent hour so that we aren't half present the entire next day. The other night I slept horribly. I am not sure if it is because I had ample sleep the previous weekend or what but I was awake from 2:00 until 3:00 and seemed to be tossing and turning the rest of the night. This behavior is so unlike me as I tend to fall asleep nearly instantly and the next time I am awake is when my alarm is going off in the morning. 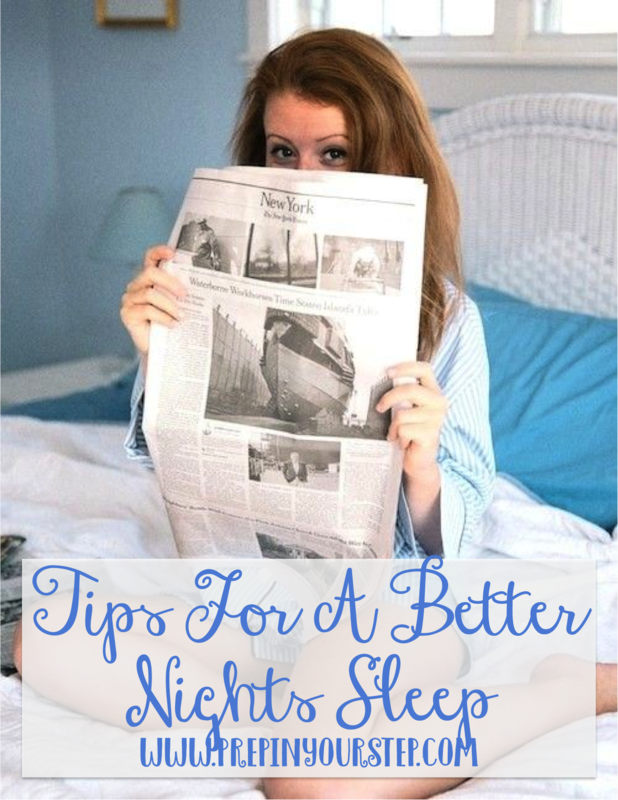 I so wish I could pinpoint why I slept so horribly the other night but since I can't I decided to put together a post for y'all of my best tips for a better nights sleep. As I am sure you are all aware I am no scientist and although some of these tips may be scientifically backed I am speaking solely from experience on here! I find that I always sleep so much better if I have worked out on a given day. Since working out gives you endorphins and endorphins make you happy (and happy people just don't shoot their husbands… legally blonde anyone?) 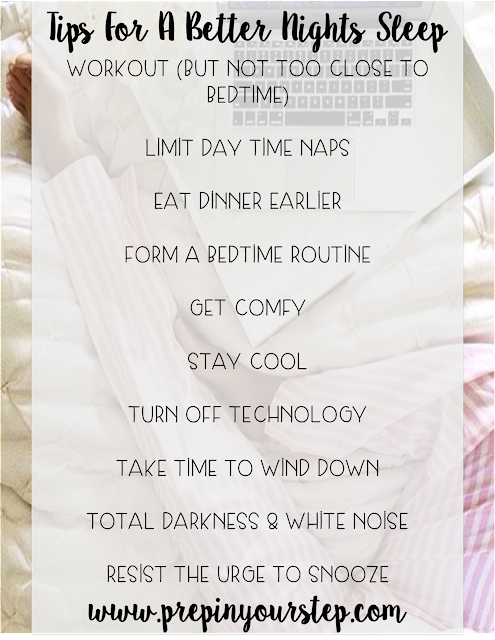 I would definitely advise against working out right before or even a couple of hours before bedtime. Using up energy in the day by working out helps me to fall asleep faster and feel more accomplished/better about my day. If allowed I would take a nice long nap every single afternoon. I have a feeling however, that I may come across as a bit lazy if I did that but I am sure y'all feel the same way. The only downside to a nice lengthy afternoon nap is that it can mess up your sleep schedule making it more difficult to fall asleep when bedtime comes around. Eating dinner earlier not only gives your body more time to digest your food but it also helps you to avoid too much afternoon snacking. We usually eat dinner at home anywhere from 6:30-7:10ish and my internal schedule seems to be a bit thrown off when I eat a lot later. Consistency is key with so many things and forming a bedtime routine helps to get your body into the idea that sleep is on its way. Shower, brush your teeth, turn down your bed… whatever the routine is I think it is really beneficial to have one to help transition your body to prepare for some shut eye. I am an absolute sucker for cute pajamas and my home decor board on pinterest definitely receives the most TLC from me so this would have to be my favorite tip. Getting comfy for me involves putting on pajamas (ideally a matching set) and arranging the pillows on my bed to form a bit of a bunker (we are talking 8 pillows that trap me in my bed). This could even mean putting on a pair of socks or curling up with a book depending on what you prefer. I LOVE sleeping in the cold. I have always thought of this as the ability to add more blankets if needed whereas if you kept it hot you could only shed so much. Dropping the thermostat a few degrees and flipping on my ceiling fan are must dos if I am going to sleep well. So, this is the one I tend to fail at. This is due partially to the fact that I usually write my blog posts at night and enjoy checking social media but I am slowly going to start transitioning my habits so that I have more screen free time before bed. This sort of goes along with a routine but I love reading a book before I go to sleep for the night. I have even gotten to the point that I put on a book light instead of a lamp so that I am preparing myself even further for bed time as you'll discover with my next tip. I used to hate sleeping in complete darkness but I have now gotten to the point that I can't have it any other way. Once the lights are out I flip on my sound machine (since too much silence can be a bit eery) and am completely ready for bed. The snooze button and I have become a bit too friendly as of late and I am slowly trying to rid myself of that habit. I am fully aware that if I just wake up the first time my alarm goes off instead of fighting for 5 minutes of crummy extra sleep I will be doing myself a favor but my brain isn't aware of these facts so early in the morning. As I mentioned earlier, I use the app Sleep Cycle to track my sleep and it has an amazing feature that allows you to set your alarm for a time (say 7:30) and the app monitors your sleep movement and wakes you up in the 30 minute time frame of your alarm (between 7:00-7:30) when you are in your lightest sleep. This helps you to wake up happier and more energized instead of overly groggy which definitely happens to me when I hit the snooze button a couple of times. I would love to know what tips you may have for getting a better nights sleep! If you have any great ones that I haven't mentioned definitely leave them below. Also, if you have any post requests I would love to hear those as well as I begin to schedule out my month! I agree with the no snooze button tip! I never have used it so I don't feel the need to do so! One of my friends used the SleepCycle app and loved it (she said especially the gradual wake up)! Thanks for the tips! Summer has definitely screwed up my sleep schedule, and I'm trying to get it back! Collectively, there are lots of choices agreed to a person: fake chanel, light weight aluminum as well as proceeded to go upward through platinum eagle, as well as light weight aluminum as well as platinum eagle, that could encounter all of the requirements associated with varying individuals. However these types of 3 consist of superior gem example back again, alligator connect, as well as light weight aluminum flip-up hold maintaining the automobile secure launch hyperlinks. Drinking water degree of opposition is always to 100 yards. The costs include something through two, 500 cash in order to 10, 000 cash that is to be released within 06 or even Oct. Showcasing it's great results, Pull Heuer rolex replica in order to released the actual Carrera Customs Choice this particular present 12 months, this can be a take a look at as time passes as well as day in addition to a chronograph along with traditional appears while using heritage associated with Carrera. This particular brand new structure hublot replica sale within 39 millimeter constructed with a computerized High quality 6 motion within the imply period, it really is setup utilizing an azurage produced little moment counter-top. The specific day gets to 6 o'clock. For Trainer purses from the collection, I must acknowledge that they're truly adorable as well as youthful. Vibrant cartier replica sale along with clean colours as well as fun tag heuer replica uk make sure they are end up being special as well as eye-catching. I've been having trouble sleeping so this was particularly interesting for me!! thank you for the tips! Sleep is one of the most primary nutrients for the human body, As you said bed time routine is important to have good sleep. Even if I'm not necessarily feeling ready to sleep, I make sure to go to bed at the same time every night.